No matter what type of legal case a person may find themselves a party to, a financial discussion will usually take place during the first meeting. When I first met Mr. Gregory Cummings it was in a back office at a bondsman’s office (Mr. Cummings complained about the surroundings, yet he chose for us to met there). The only thing that I knew about Mr. Cummings was that he’d represented murder suspect Danielo Bradshaw during the Rachel Hoffman Murder Trial. I didn’t know as to what capacity he’d represented Danielo Bradshaw under, but I knew Mr. Bradshaw wasn’t the actual triggerman and received a life sentence. In no way did I judge Mr. Cummings on his representation of Mr. Bradshaw. Personally, I didn’t know enough about Mr. Bradshaw’s involvement to have an opinion on his sentencing. Furthermore, most of what I learned about Mr. Cummings and his handling of Mr. Bradshaw’s case came from Mr. Cummings himself. Mr. Cummings told me that he was Mr. Bradshaw’s Court Appointed Attorney. At that time my only knowledge of Court Appointed Attorneys fell under Public Defender. So Mr. Cummings was nice enough to explain to me the difference between a Public Defender and an attorney working out of the Conflict Counsel’s Office. In summary, they’re basically the same—they’re both paid out of taxpayer’s dollars. One particular event that Mr. Cummings discussed in regards to Mr. Bradshaw’s case was how he (Mr. Cummings) and a private investigator that was assisting him on the case took a trip down to the U.S. Virgin Islands to interview Mr. Bradshaw’s grandmother. Mr. Cummings seemed to gloat about the travel and the time he and the private investigator spent down there. He never did mention what Mr. Bradshaw’s grandmother had to say. Now you must know that one of the reasons why I hired Mr. Cummings was because he (Mr. Cummings) told me that although he could not take my son’s case through the Conflict Counsel’s Office, he could file Indigence on my son’s behalf. He specifically stated that the reason why he worked alone (no paralegal) was because he knew how to file the necessary paperwork himself in order to get the State to cover some of his costs. Clearly, Mr. Cummings didn’t want me to believe that he and the private investigator financed their trip to the U.S. Virgin Islands out of their generosity and determination to help Mr. Bradshaw. So the question is who financed the trip? And what was the purpose for the trip? I don’t think that it takes a “rocket scientist” to know who financed the trip. I do know that Danielo Bradshaw’s grandmother was not a “key witness” in the murder case. I learned through a close source that Mr. Cummings did use Mr. Bradshaw’s grandmother’s statement as a character witness’ statement. However, as taxpayer’s we know that a trip to the U.S. Virgin Islands by a Court Appointed Attorney to obtain a statement for the purpose of a murder suspect’s character is not a justifiable expense—especially if it was on our (taxpayers) dime. Mr. Cummings was on my son’s case for a year and four months; I paid him approximately $32,000. He did not bother to hire a private investigator. He did not travel the short distance to the Daytona Beach area to take Trentin Ross’ deposition (Trentin Ross is the person that the Assistant State Attorney/Jack Campbell is calling their “key witness’”). Mr. Cummings did not bother to set up a teleconference or a video conference for a deposition. It’s not secret and I will tell anyone that the State of Florida’s pockets are way deeper than mine. I can’t afford to pay for myself to fly to the U.S. Virgin Islands, let alone an attorney and a private investigator. Mr. Cummings spending as a Court Appointed Attorney extremely surpasses what I had to offer as a private client. 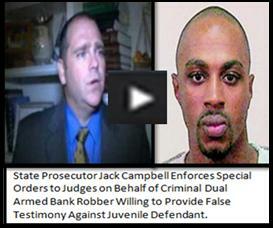 When placed on a scale, Mr. Cummings past, present, and future cases that come directly out of the State Attorney’s Office or Conflict Counsel’s Office outweighed the injustice that State Attorney/Prosecutor Jack Campbell was/is striving to serve a 17-year-old child. Danielo Bradshaw’s case was just one case. God knows how many other cases have passed through the Leon County Courthouse whereas taxpayers paid for “Perks” associated with the case.